“In 1853 the Rev. Thomas Espinell Espin was appointed as Hadleigh’s rector. 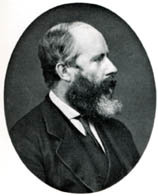 A highly educated man, Espin had been a Fellow of Lincoln College, Oxford, and had worked there as a tutor from 1852. 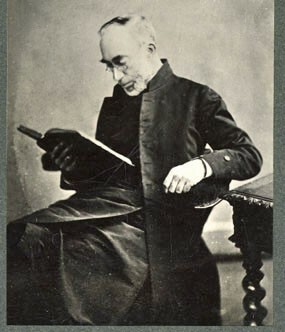 He was to serve on the Essex Diocesan Board of Education, as well as being a Diocesan Inspector of Schools. With his strong belief in elementary education for all, and the income from the Lovibond trust fund and local donations, all that was now needed was the land on which to build the school. “The land for the school was provided by the lady of the manor, Lady Olivia Sparrow. 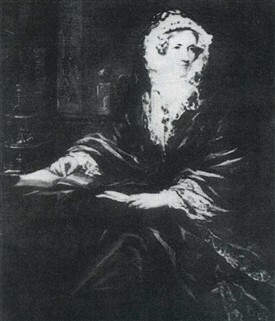 In December 1853, Lady Olivia Sparrow was awarded former common land when it was enclosed. She donated a plot of former common land on the village’s main street for the new school, the site of the present Sandcastles Nursery. 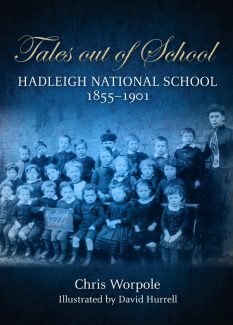 Prior to the National School building opening at Hadleigh in 1855, the education of the village children was mainly limited to the Sunday School set up at the parish church in 1820. White’s Directory for 1848 records how this Sunday School was financed: “In 1820, Mrs. Martha Lovibond gave, for the education and clothing of poor children of this parish £750 [worth £31,440 in today’s money].” Martha Lovibond was the daughter of Sir Elijah Impey, Chief Justice of Bengal 1774-89. She married George Lovibond Esq. in 1793, and they lived at Hadleigh House (later Victoria House). As early as 1836 it had been suggested that the income from Mrs. Lovibond’s trust fund could be used to establish a National School in the village. In October 1811 the National Society for Promoting the Education of the Poor in the Principles of the Established Church was founded, its mission being to ensure that “the National Religion should be made the foundation of National Education”. 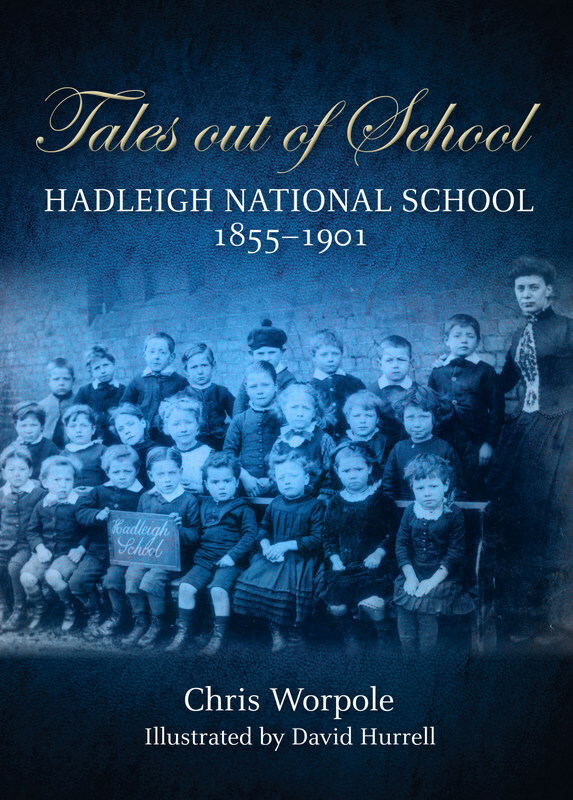 As it was usually the local clergyman who was responsible for establishing a National School, this is the reason no school was built at Hadleigh until 1855. Since 1825, the rector of Hadleigh had been the Rev. John Mavor. However, he left the parish in the charge of curates while he lived at Oxford. From 1844, until his death in 1853, he was imprisoned in the debtors’ section of Oxford Gaol. The new rector, Rev. Espin, became the catalyst for the building of the school. From the 1840s the style of school architecture was deliberately Ecclesiastical Gothic, aiming to promote religion along with education. The teaching method used influenced the interior layout of the school. 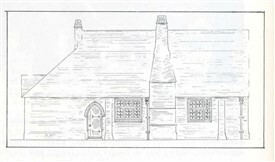 George Edmund Street designed the school at Hadleigh in 1855 with one large schoolroom, which could accommodate up to 100 children. 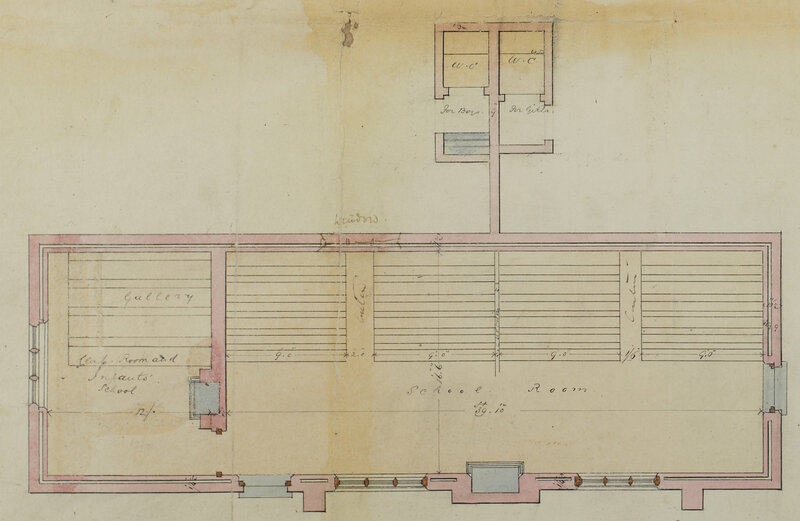 This large school room measured 39 feet and 10 inches by 16 feet and 6 inches (approximately 12m by 5m). School buildings were designed in this way so the one and only certificated teacher was able to observe the entire school. 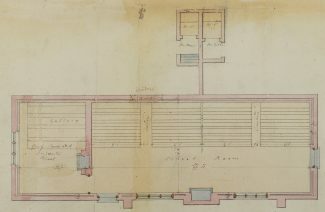 Street’s plans show fixed rows of desks facing the master’s desk. Traditionally standards were placed at the end of the rows in this style of school marking the different age groups. This is why the name ‘Standard’ was later used to describe a class. 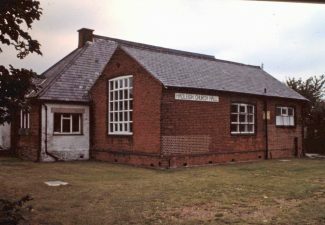 It was also in the 1840s that separate classrooms were added to many schools for infants, and the Hadleigh school was built in this style. Street’s design includes a gallery, where the desks were arranged on steps, so that the infant mistress could see all the children and they could see the pictures that lessons were based on. After nearly seventy years, the National School closed in 1924 and the children transferred to the Council School in Church Road. The old school building became the parish church hall following the closure of the school. 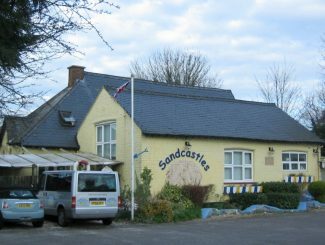 After falling into disrepair, the building was purchased and modernised, and reopened as Sandcastles Nursery in September 2000. So, once again, the children of Hadleigh are being educated in this Victorian school building, which was designed for that purpose nearly a hundred and sixty years ago. Here is the companion article about George Edmund Street. Here is the article about the book, Tales out of School.